"Back In My Day" is an irregular series in which I take one aspect of Star Wars: The Old Republic and look at how it has evolved over time. This particular installment was inspired by me doing a lot of questing on Ilum recently, which got me thinking about how many of the quests there used to be daily repeatable but aren't anymore. This went about as well as you would expect. In a post from February 2012 describing my first impressions of the Belsavis dailies, I hilariously noted that I didn't even know where to go and where to start, as there was no "daily hub" or anything, and the daily missions were utterly indistinguishable from regular one-time quests. Story-wise, a lot of them made no sense either. Now, daily tasks in an MMO require a certain suspension of disbelief most of the time, but there are still ways to make them more credible vs. blatantly hitting the player over the head with how little sense it makes to repeat certain things. My favourite example of this was always the Republic quest on Ilum that had a little astromech droid desperately seeking help and supplies for his owner, a recently crashed fighter pilot... who apparently crashed every day? We used to joke that the guy was really just a hermit who happened to live in a ship wreck and we were basically his daily supply run. Mechanically, things were pretty bad as well. People were complaining about others not space-barring through the daily quest givers' dialogue quickly enough long before anyone got tired of the cut scenes in flashpoints, but at the same time they didn't just want to have the mission shared with them because they did want to go through the cut scene to farm social points and/or companion affection. The area also didn't really seem to be designed to have a large number of people questing in it at the same time. Most infamously I remember the quest on Republic side to kill Rattataki leaders, of which you needed three for the quest, and there were only about five in the area, with half of them habitually bugged out and unkillable. Sometimes I'd just sit down and wait for the same guy to respawn three times. Now, all of this may sound horrible, but it wasn't really that bad. It wasn't well designed for its purpose, but at least for me it also managed to stay below the threshold of actually becoming tedious and annoying. The fact that the Belsavis bonus series included no less than three heroics encouraged people to group up for the whole chain of dailies, and the end result felt kind of awkward but also fun. The payout was also high enough that you never really felt like you actually had to do the whole thing on a daily basis to stay afloat. Patch 1.2 introduced the game's first "proper" daily area, the Black Hole on Corellia. It was a bit of a pain to get to as you had to go through no less than three loading screens to travel there, but it was much more streamlined for its purpose. There was an introductory quest with dialogue on the fleet, but then the actual dailies could just be picked up from a terminal all at once and were neatly clustered around the area. Bioware decided to keep encouraging people to group up by also adding a heroic mission, as well as a weekly meta quest that required you to complete each mission, including the heroic, exactly once. 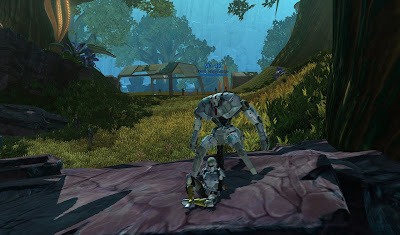 I noted at the time that the concept of the weekly was very much in line with SWTOR's very casual-friendly approach, in that the best rewards only required you to visit the area once a week. It was also very much worth doing as the weekly also offered a new type of currency called Black Hole commendations, which could be used to buy new and more powerful gear from vendors on the fleet. Section X reiterated on the Black Hole and mostly tried to improve it. 1.5 was also the patch that included the free-to-play conversion though, which led to the weird experiment of making the new zone into paid content that you could unlock by subscribing or via a special access pass (which was eventually dropped). I can't even remember what sort of rewards the missions gave at launch, but they were most assuredly overshadowed by the introduction of the reputation system, which also made Section X the first daily area with a reputation attached and gave players an incentive to increase their standing with the faction just to get access to things like cosmetic armour shells and pets. The area was also spiced up by featuring the start to the quest chain to acquire HK-51 and having the world boss Dreadtooth path around the area. People with an interest in world PvP were delighted to actually run into the other faction on occasion now - one thing that had been a bit odd about the Black Hole was that even though technically Republic and Imperial players were playing on the same map, their quests were on entirely separate halves of it and they never even crossed paths. In Section X the two factions still had their own separate missions, like in the Black Hole, but they took place in roughly the same area, and the heroic mission for the weekly was even located in the same instance. The heroic mission in Section X was the one somewhat controversial thing about the area, as it required exactly four people for successful completion - you couldn't substitute someone with a companion as there were several sections where people needed to click on things in sync to bypass some force fields. This was a bit of a nuisance, and was later on removed without much fanfare, though the quest's [Heroic 4] tag wasn't changed. Personally I only found out that I was suddenly able to solo it pretty much by accident. 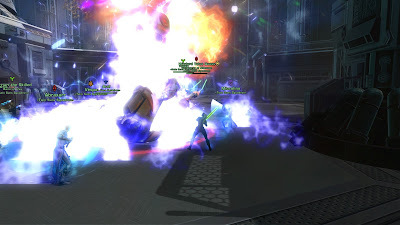 Patch 1.7 introduced the Gree event, the first world event that was designed from the ground up to be repeated, and which re-purposed the previously abandoned Western Ice Shelf on Ilum where the big open world PvP debacle from launch had taken place. While it also featured one instanced and two open world bosses, the main focus was once again on daily missions with which you could earn reputation to unlock some nice goodies from the local vendors. The biggest controversy here was Bioware's attempt to use dailies more openly to encourage people to engage in world PvP within a small separate area down south, which would not allow you to be in a group larger than four, dismissed companions, and flagged you(r group) for free-for-all PvP. Personally I thought this was quite fun and novel, but some people got very hung up on the mere existence of two daily quests that required you to flag for PvP, despite of their rewards being minimal compared to the regular dailies. 2.0 was not a very successful addition to the game in terms of daily quest endgame. There were daily quests to do on Makeb, but they were part of the super awkward Makeb Staged Weekly and required you to limit yourself to one mission at a time, which had you travelling all over the damn place and wade through dozens of mobs just to achieve a single objective. Myself and most people I knew did it once or twice and then decided to go back to the old daily zones because they were much more fun. Rise of the Hutt Cartel also introduced Galactic Solutions Industries as a faction, which asked us to make use of our new Seeker Droids and Macrobinoculars which we had acquired through one of 2.0's side mission arcs. Like the Makeb dailies these were very spread out, across different planets even, though at least the fact that many of them were on lower level planets allowed you to travel largely unimpeded, and quite a few of them didn't even require any combat at all. Unsurprisingly, these weren't a huge hit with people either, though there does seem to be a niche audience for them that appreciates the slower and more relaxed gameplay that they offer. What was really odd about CZ-198's weekly mission though was that it required you to run both of the local flashpoints in addition to doing all the dailies... which was a bit awkward to be honest. It's probably the reason I got the achievements for running these on story mode twenty-five times more quickly than for any other flashpoints, and I remember trying to always have the CZ weekly in my log before running a random just in case one of the Czerka flashpoints would pop up. This odd system was eventually patched out in 3.2, when the requirement to run the two flashpoints was replaced with a single heroic mission to kill a big droid. 2.3 was also the patch that introduced the second recurring world event, Bounty Contract Week. This followed more in the steps of the Makeb Staged Weekly, by making you choose a single daily quest that you then saw through to form a kind of storyline. It was a little weird, but still made a lot more sense than the stuff on Makeb. Oricon always felt to me like it was made by the same team that created CZ-198, only with small improvements: again we were in a small area shared by both factions, both doing the same quests. Even though the change to the CZ weekly to not require flashpoint running anymore didn't come until much later, it seemed like Bioware already felt a bit awkward about that particular design decision, so the Oricon weekly featured a daily in a heroic area instead. It was brutal and I loved it - to this day it remains at least moderately challenging despite of how much heroics have been toned down in general. What was different was that there were bonus missions for those who had unlocked their Seeker Droids and Macrobinoculars - CZ-198 had only featured a one-time quest for a pet, but the bonuses on Oricon were attached to dailies and therefore repeatable. More importantly though, there was a much bigger attempt to tie the whole area into a story. On CZ-198, there was an introductory quest that asked you to run the flashpoints, and the flashpoints were part of the weekly, but the dailies were just kind of... there. Oricon took a different approach, by unlocking the daily quests one at a time and tying them into a quest chain narrative that you had to complete once before the missions unlocked as daily repeatable from the nearest terminal. (As an aside, the story was also refreshingly different for the two factions despite of running along the same general lines.) The story quest then cumulated in you being sent to do the two Dread operations, something that generated some resentment among solo players, but that's really another story as it had no impact on your ability to do the dailies. (Fun fact, I couldn't actually find any patch notes about this... I only know that the event came with this patch thanks to my blog posts about it.) The third big repeatable world event, the Rakghoul Resurgence that would come to rotate between three different planets, took a fairly conservative approach and basically mirrored the basic setup of the Gree event, with a small enclosed daily area, an instanced operations boss and a couple of open world bosses. They just dropped the PvP area and replaced it with another heroic area instead. What was somewhat revolutionary at the time was that the event was trying to be level-agnostic - the mobs in the tunnels were mostly very low level and would only spawn reinforcements of your character's level once you got aggro, allowing players of (nearly) all levels to join in the fun. 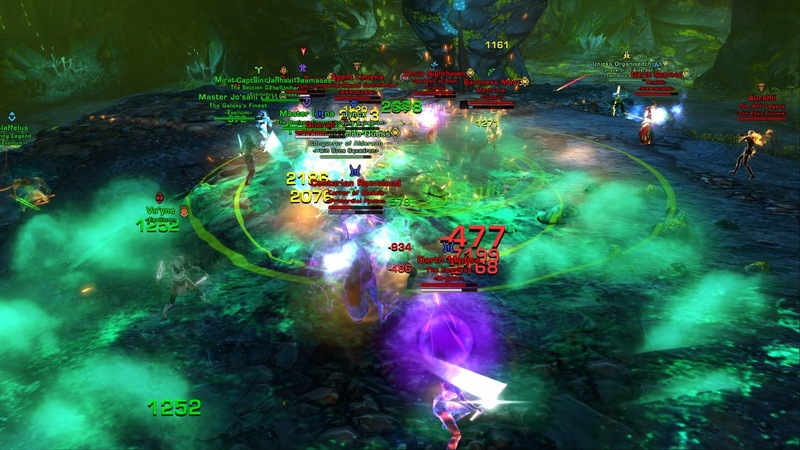 The operations boss The Eyeless was also the first boss that featured PvE bolster, boosting lowbies to a high enough level that enabled them to participate. It's kind of ironic that this whole event appears to have been overlooked when they introduced the galaxy-wide level sync in 4.0, which now makes it feel kind of outdated and causes lowbies to get left out of parts of it due to some of the system's limitations. Shadow of Revan's two new planets were a funny bunch in terms of dailies. Rishi featured several missions that were daily repeatable, and some of them even had achievements attached to repeating them often enough, but they were scattered all across the area and had no coherent theme or reward structure to them. Yavin IV was the "real" new daily area of the expansion but required you to complete the storyline first. There was the whole thing with giving you the choice of either doing dailies or doing the Temple of Sacrifice operation to complete the storyline, which was honestly just kind of awkward. The dailies themselves, once unlocked, were decent enough fun and proved very popular. I ranted at the time though that I thought they were actually kind of over-incentivised, with the hugely powerful companion gear that was rewarded by the weekly making you feel like you kind of had to do them to kit out your companions (this was back when their gear affected their power level). What's also noteworthy is that while there was a weekly quest to kill the walker world boss on Yavin, this was completely separate from the regular weekly mission for the daily quests, which could be done solo in its entirety and was therefore the first of its kind to not feature any kind of grouping component. After the fun of Yavin, the dailies on Ziost felt like a bit of a step back. 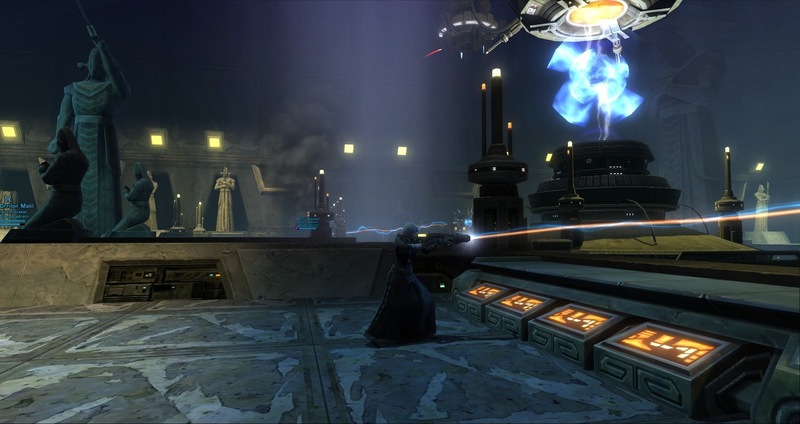 Requiring the completion of both the basic Shadow of Revan story as well as of the Rise of the Emperor patch, they presented the as of then largest number of hurdles to overcome in order to gain access to a new daily area. It wasn't exactly a prohibitive amount of effort or anything, but compared to the ease with which any alt could jump into any of the pre-3.0 daily areas it felt like a lot. Mechanically it was interesting in that all the dailies were non-combat missions, enforced by the circumstances of the story... but the big problem was that there was basically zero incentive to come back. Where Yavin felt like it was almost showering you with too many rewards, Ziost had nothing, neither a reputation to work on nor anything interesting to buy with the currency the quests rewarded. I expect the value of all rewards to deprecate over time, but I distinctly remember Ziost being the one planet where I did one round of the missions on the day of release, looked at the local vendor, and realised that he didn't have anything of interest to offer even on day one, which was kind of disappointing. My impression is that I wasn't alone in this and that Ziost has remained comparatively unpopular with the masses for this reason... though again, some players did appreciate the novelty of the combat-less mission design. Knights of the Fallen Empire brought with it a new focus on solo story, and new dailies were not really a part of Bioware's plan because they were considered too MMO-like I guess. Since the devs were busy retuning a lot of content anyway though, they decided to make most of the old heroics soloable while also attaching Alliance endgame rewards to them, which basically means that they morphed from being open-world group content for levelling players into just another set of endlessly repeatable dailies. I hated that, but based on the responses I got to the linked post a lot of people felt the opposite way. As part of this great, galaxy-wide tidy-up, the former dailies on Belsavis and Ilum were also turned back into the regular quest chains they had clearly been meant to be from the beginning, so you did them once and that was it. I didn't even notice this for a long time, but as with all things, there were people who were unhappy about the change because they had actually still been doing those old dailies, mostly as a way to farm companion affection. 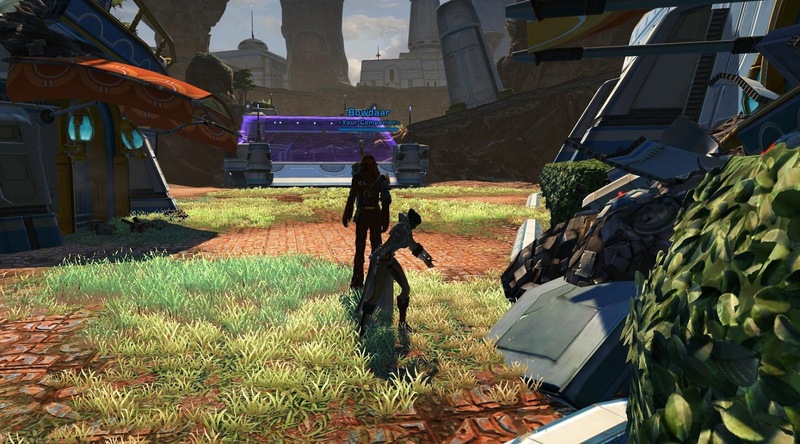 Nearly two years after Ziost, Bioware brought us our first new daily area in ages in the form of Iokath. While everyone was quite excited about getting a new planet to explore, what we eventually got felt a lot less iterative than the previous daily areas, and more like they struggled to remember how to design this kind of content after a long time away from it. It felt as if they picked a bunch of features from the old areas, mixed in a couple of new ideas, and simply hoped that the end result would be fun. Unfortunately the different parts didn't gel too well and in the end it was more of a slightly awkward mishmash. There is an initial storyline like on Oricon, and a couple of the quests you complete in it do return as dailies, but most of the repeatable missions are actually quite different. The quests are more or less the same for both factions and take place in a shared area, though it's larger than most daily areas. Travelling around the zone is also very convoluted, making questing on Iokath very time-consuming. One of the new features was the concept of different daily missions rotating on the terminal from one day to the next, and the player being expected to do more than one day of them to complete the associated weekly quest. There were also several vehicle quests, which were very badly tuned in terms of cost vs. reward at launch, and while Bioware fixed this later, the bad first impression tarnished many players' impression of the planet forever. The vehicles were also meant to encourage PvP, but the combination of the initial high cost to buy them as well as the awkward geography not really encouraging people to meet up made that fall flat on its face as well. 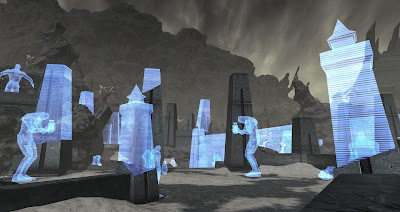 Nearly three years after the last bunch of daily quests that also featured group content, Bioware also decided to include a single world boss on Iokath, the Colossal, and to make a daily quest for him... but since it wasn't required for the weekly and wasn't even marked as a group quest, most people picked it up once, went "mm, nope" once they saw what they were up against (or maybe did it once just for the achievement) and that was that. It's not like the boss drops anything either. Looking back at this history of SWTOR's daily quests / areas, I see several different developments over time. Aside from launch and it's "improvised" dailies, the Black Hole's precedent of the terminal with both dailies and a weekly quest was something that quickly became the norm and that has persisted to this day, but other aspects of the system have been more fluid. First off, there was a lot of experimentation with story. The first daily areas just offered a voiced introduction and then tried to engage you by giving you different things to do on each faction. On Makeb and with Bounty Contract Week they seemed to try to create a sort of daily repeatable miniature story, with very mixed results. The Oricon approach of weaving the dailies into a one-time story was the most attractive way of going about things in my eyes. More recently they have gated largely separate dailies behind doing a longer, one-time story quest, which I haven't been quite as fond of. There was also a gradual abandonment of group content. The early weeklies up to Oricon all had some sort of group component to them (even if CZ-198's flashpoint running requirement was eventually abandoned as a failed experiment), but with Shadow of Revan that all went out the window. The Colossal on Iokath felt like a hesitant breadcrumb thrown at players who liked to group up, but it wasn't handled very well in my opinion. Finally, there is an interesting undercurrent of wanting to incentivise world PvP every now and then, most notably with the dedicated PvP area on Ilum but also with the Iokath vehicles, yet people never seem to have taken to it very well. From my experience the best thing to do still seems to be to simply force both factions into a small space and then let them sort themselves out. I've had some enjoyable world PvP both on Oricon and in the Rakghoul tunnels. In a few days we'll all get to see the game's newest daily area on Ossus. I've mostly avoided spoilers about it, though I hear that there are supposed to be some new heroics, which is something that I at least would definitely appreciate. As far as story integration and world PvP goes, we'll just have to see! For the most part, I’m pretty happy with how SWTOR has implemented Daily Quests. First and foremost, having the Weekly quest be the real incentive is great; not needing to revisit CZ or Oricon more than once a week really makes a difference; and having reps shared across the Legacy doesn’t hurt either. I appreciate what they were aiming for with Makeb: a sort of choose your own dailies approach, but I agree the quests ended up being too sprawling and more trouble than they were worth. Going back for the achievement when they announced they were removing the staged weekly was plenty enough for me. I confess I enjoy two the hubs you do not: Ziost and Iokath. I find cruising through Ziost at a relaxed pace knowing there will be very little combat makes the zone a refreshing change of pace. I once completed the weekly without even killing a single mob. The thought of that still makes me smile. As for Iokath, I get the hate, but now that I know the map, I find it easy to get around. The trick is to load up on the quests on days before I want to do the weekly, so that I have most of them available when I do. Clogging my quest log with quests I won’t complete for a couple of days is probably bad design, but when I do bang them out, it really only takes 20-30 minutes to finish all ten. If I mix in the walker quest, that takes longer, but I find crashing around in a walker its own reward. I enjoy the mouse droid and the turrets quests, which award big payouts especially considering how quick and easy they are. I also give credit to BW for supplying the rep vendors with lots of rewards, including one of the best looking Legacy armor sets in the game, and plenty of cool decorations. However, I do agree with you about the changes to Heroic. Running the old heroics with a friend or two was one of my favorite parts of the leveling experience. Now all that’s left of them are the absolute worst aspects of MMO gameplay: kill spiders, collect bear asses, rinse repeat, with no connection to any story or sense of place whatsoever. I will grudgingly do a few for Conquest, and I suppose they do populate the low level worlds with more players, but I don’t consider either of those a fair trade for what was lost. I hate what heroics have become. I did not try out the Ossus dailies on the PTS. I was more interested in sightseeing, but I’m hopeful the new zone is fun enough to merit repeat visits. I actually like the Ziost dailies in terms of gameplay too. I also remember working on that achievement for jumping the speeder over one of the monoliths; that was pretty fun. The combination of story gating and complete lack of useful rewards is just a deal breaker for me. Basically I always do the rounds once on every character that unlocks the planet and then never go back. Iokath has actually grown on me over time. The addition of the "missing dailies" and the reduction of power shard prices for the vehicles has really helped, and I do the same thing as you: collect all the quests over a couple of days and then go on one big binge (usually during a week when Iokath also features in the Conquest objectives somehow). I still don't like the geographical layout though - it reminds me of Corellia and the way all the roads seem to be laid out in such a way as to force you to take the longest possible route between any two spots. Yet again an awesome post if one (re)joined only later. I can't really remember doing many dailies back at launch or when Makeb came out. There are a few zones that are awesome. I don't really like daily quests in MMOs, unless I feel they are worth the time. There are some zones that feel like this: Ziost, Black Hole and CZ-198. I can do the weekly quickly enough and it's how I leveled most of my toons to Command Level 300, chipping away at the dailies + weeklies each week. I also really like Yavin 4, even if it's a bit lengthy. Section X I'm kinda torn on. First I think the Empire one is a lot easier and quicker than the Republic one, especially if you're not super awesome with AoE damage. It's ok, but once you reached the highest reputation rank it's not really worth the time. The Makeb weekly is just horrible. And for some unspecific reason I don't like Oricon at all, maybe it's the gloomy red surrounding. I think you're right that it should feel a little like CZ, but for me it toally does not. I'll do it once or twice more to finish the rep grind, then will return only for Conquests. TLDR: I love some daily areas because they provide quick XP, I like the more convoluted or complicated ones a lot less. I think judging the daily areas by which ones give the most credits or CXP per hour is probably pretty common. It's just not really relevant for me personally as I haven't really done dailies for credits in a long time (my normal play style seems to earn me enough to keep me afloat as it is), and I prefer doing other things for CXP. I mostly do dailies once per character "for the story" and then for Conquest when it aligns with the weekly objectives. The funny thing with Oricon is that when it launched I fully expected to find it too oppressive to enjoy it for long, but somehow it hasn't worked out that way. I couldn't tell you what exactly makes me like it so much, though I listed some of the reasons in the post that I linked from this one in the Oricon section. I did not realize that they changed the Belsavis and Ilum dailies back to one-time quests. That tells you how long it has been since I tried to do them. I didn't do them much -- I can hardly remember what they were -- but I do remember that they could be a nice change from dailies in other areas. Sometimes it is nice to go back to old dailies when another daily area is congested. I didn't realise it for a really long time either. What brought it to my attention was seeing someone complain about their removal a few months ago. Yeah. Never was really big on Belsavis, mainly because I found that planet too big, confusing to navigate (especially the teleporters), and generally rather boring. The abundance of gathering nodes is definitely another plus in favour of Yavin! I've chosen to do the dailies there on a character with gathering skills in the past purely because it gave me an excuse to make the rounds around the area and hoover up tons of mats.